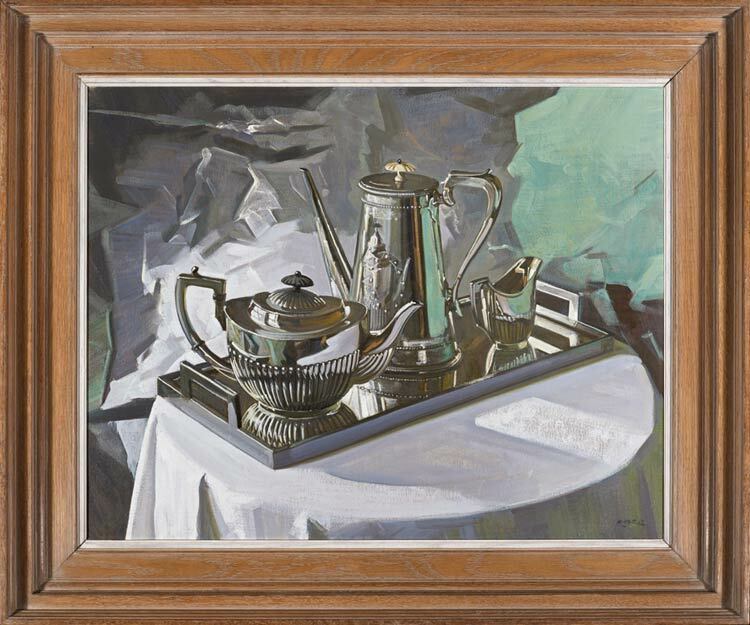 Silver was another material which appeared in still life paintings from an early point; like glass, it posed particular problems of representation, and like glass it was also luxurious, desirable, and – in a painting – could enhance the status of a patron through the successful depiction of items in his own collection. 17th century Dutch still life paintings often combine silver and glass (Willem Kalf, Still life with a chafing dish, pewter, gold, silver and a glass, Private collection, New York); but they rarely deal with quite such a mirrored surface as we see here. Even William Nicholson’s 1938 painting, Silver teapots, with its superficially similar concept, is not nearly so complex. This work takes the solution of the tricky silver problem to a level beyond that of the Dutch masters, to a point where the surface of the objects appears to melt and flux under the pressure of the variously reflected spaces which colonize their different facets. This is a painting which is intensely decorative and almost completely abstract, in that the objects it depicts have been separated from their inherent significance and rendered in terms of juxtaposed flat surfaces. It is a still life of faithfully-drawn items, and also a musical arrangement of tones and colours: a stunning intellectual and sensuous achievement.